Canon Europe, leader in imaging solutions, today announces the latest device in its broad range of document solutions, the imageFORMULA DR-M260 scanner. Providing high-speed document capture, unrivalled paper feeding performance, enhanced image quality and superior reliability, the imageFORMULA DR-M260 enables partners to address the evolving requirements of any company or business function with high demand for the distribution of scanned documents. Possessing the latest high speed scanning technology and features to enhance document quality, the imageFORMULA DR-M260 represents a great addition to the range of solutions that partners can offer. The device’s technology enables businesses to capitalise on existing sales and maintenance experience in order to provide dependable levels of consultancy to customers. The built-in performance of high speed scanning, improved image processing and quality thanks to a newly developed Canon DR processor means there is no need for customers to rely on a stand-alone PC for document capture. For partners, this represents a huge opportunity to bolster their support for mobile working environments and ongoing consultancy around mobile working, powered by decentralised scanning capabilities. The device’s DR processor also cuts down colour unevenness and includes cutting-edge image processing technology capable of delivering images suitable for Optical Character Recognition (OCR). Designed to meet the challenges of modern customers operating in fast-paced, office environments, the imageFORMULA DR-M260’s high scanning power is reinforced by a colour scanning speed of 60ppm, combined with an Automatic Document Feeder (ADF) capacity of 80 sheets of paper. 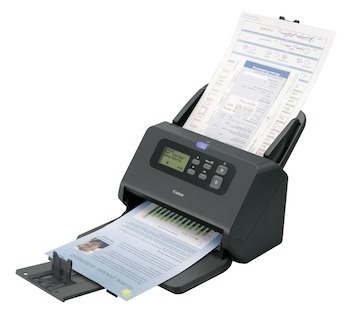 A huge range of documents can be processed by the versatile imageFORMULA DR-M260, from written applications and legal paperwork to receipts and business cards. The device is capable of processing documents of varying thickness, type and length thanks to its Long Document Scanning Mode. The robust paper feed mechanism means that partners can provision these capabilities without increasing ongoing maintenance expenditure associated with the cost to serve. Cost is further minimised thanks to the imageFORMULA DR-M260’s paper feeding error detection and paper eject sensors. For partners catering to document-intensive businesses, a paper feeding error detection sensor instantaneously identifies irregularities, such as skew caused by jammed paper, and immediately stops feeding to prevent document damage. The device’s paper eject sensor also prevents harm to original documents by identifying unusual document length transit time. Mounted to the Contact Image Sensors (CIS), it stops feeding by deactivating the roller when the document leading edge is not able to pass through the paper eject sensor within a certain time. For partners, these features significantly reduce ongoing maintenance costs as the device eradicates many common issues associated with office-based document capture. Reducing the requirement for partners to provide a significant amount of training, the imageFORMULA DR-M260 comprises a highly user-friendly LCD operating panel. The clear, intuitive screen improves ease-of-use for customers while reducing installation and setup time for partners. The Canon imageFORMULA DR-M260 will be available across South Africa from July 2017.